At Home With The Hansens: Sick Me Out! I immediately went searching for the best way to clean my mat and found it to be suprisingly simple! Thank goodness because I don't have time to mess around with timely cleaning techniques! 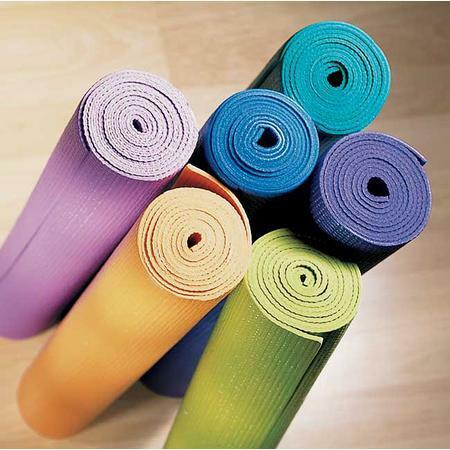 It turns out yoga mats are machine washable, as long as they don't go through the spin cycle. Though for routine cleanings you can simply make a mixture of one part warm water and three parts gentle cleaner such as Woolite. After applying the solution to your mat, gently rub with a soft cloth or sponge, rinse and hang to dry. And voila, you've got a clean and appropriately sticky mat! Needless to say, I will be making this a regular part of my yoga practice! omg...this is hilarious because i was just thinking this last night at my class! while i was in child's pose in fact! LOL. i actually have cleaned mine before...i ususally just wipe it down with clorox wipes. I brought mine into my apt with me last night just so i could clean it. i get totally grossed out during classes when i see people's mats that are really dirty. ewwwww.